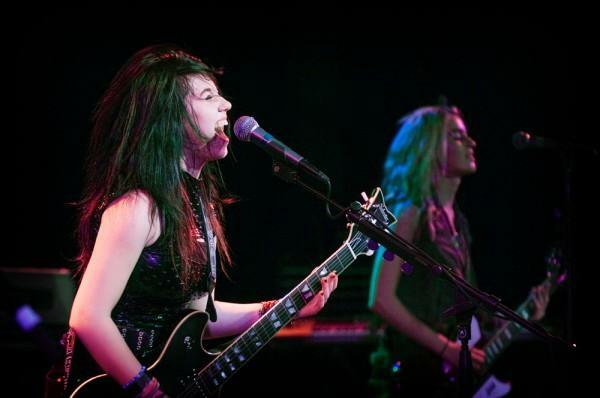 Julia Pierce and Miranda Miller of Cherri Bomb performs at the Roxy. Great news for Cherri Bomb!! Billy Corgan, front-man of The Smashing Pumpkins, announced that Cherri Bomb will be opening for them during three of their September shows. Cherri Bomb will be joining The Smashing Pumpkins tour for shows at Houston (9/21), Dallas (9/22) and Tulsa (9/24). LA based Cherri Bomb just recently played the Sunset Strip Music Festival last month in which The Smashing Pumpkins headlined. Read our review and see more pics of their show right HERE.